Shahi Tukda is a dessert, rich in taste and calorie.It is deep fried piece of bread in pure ghee.But you can avoid it by toasted it till the piece of bread become crispy from bot sides or shallow frying. Its taste is awesome. Take another pan and bring milk to boil.Add crushed cardamom and khoya.Cook till milk thickens, In every 5 minutes interval,keep stirring the milk for breaking up lumps. 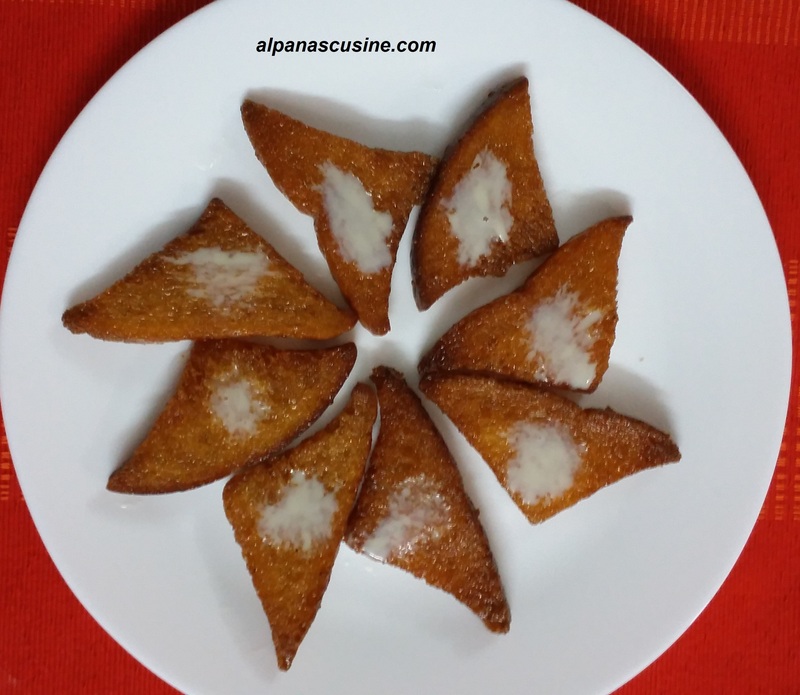 Heat the ghee in a deep fry pan on medium heat.Add two bread pieces.Fry on both sides till golden brown.Remove and drain on absorbent paper.Immerse or dip, fried bread in the sugar syrup .Repeat this process for remaining slices. Now arrange the slices on serving dish.Pour thickened milk or rabri on top of bread.Sprinkle almonds and pistachios.Serve hot or cold. If you want to make more faster way then you can use Condensed milk for toppings.